The wake of artist-run spaces and independent cultural initiatives in Argentina is telling of the state of cultural policy of a country, as well as the institutional work, or lack thereof, of established venues. But it is also telling of something else—of a need and a desire to develop communities. To be in touch, exchange with others. While the Other has discursively been assigned to those in so-called disadvantaged geo-political and socio-economic margins of society, it seems that in Argentina the other is just the foreigner in oneself in conversation with someone from elsewhere. It is less peculiar then actually symptomatic that the spaces and initiatives that have emerged in the last couple of years here are dedicated to hosting artist residency programs. I visited a couple and met with their founders: El Basilisco in Avellaneda, just in the outskirts of Buenos Aires; Residencia Internacional de Artistas en Argentina (RIAA), organized from Buenos Aires but taking place in a nearby beech town called Ostende; El Levante, a residency and art school of sorts in the city of Rosario, Argentina; and Residencia de Un Solo Artista (RUSA), which also takes place in Rosario, but this one at the home of its founding artist. El Basilisco was initiated by artists Tamara Stuby and Esteban Alvarez, and is the most established residency program in town. Former and current artists in residence seem to praise the communication imperative at El Basilisco—participating artists, who stay for approximately eight weeks, are introduced to the art scene immediately, to a new public, and are also passed on invitations and tips by Tamara and Esteban to attend a number of events in town. Alejandro, an artist who lives full-time at the house (literally) of El Basilisco, also takes the artists around and keeps the house in order. Tamara and Esteban live very nearby. 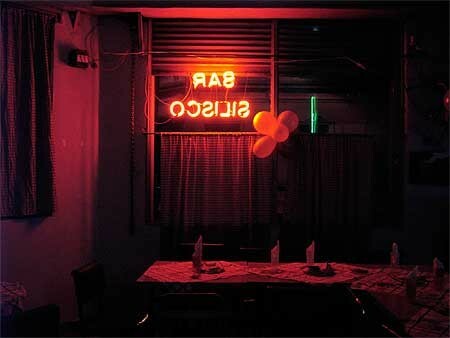 And the residency has turned the local bar into its residency lounge, adopting (or having been assigned) the name “Bar Silisco” with a neon artwork by Esteban hung from its window. But El Basilisco is not only a local affair. El Basilisco’s presence locally, nationally and internationally is felt in other ways. Their program offers three residencies happening at once, with an Argentine artist from the “interior” taking a spot, and, most times, with two others from abroad. Its attention to hosting artists from Latin America has made its program stronger and certainly more unique. It is assumed that artists from Latin America are one and the same, but the disparity between cultures and the experience of cultural exchange between countries of the Americas is relatively low. The current artists in residence are: Narda Fabiola Alvarado (La Paz, Bolivia), Luis Guerra (Santiago, Chile) and Jorge Tirner (Resistencia, Argentina). El Basilisco’s internationalism is possible thanks to their efforts in participating in the demanding and time consuming world of grant making, as well as in initiating and sustaining fruitful relations with others in the field. An example of this is their institutional residency exchange program with Helmut Batista’s CAPACETE in Rio de Janeiro, Brazil, as well as at Hangar in Barcelona, Spain. Begun in 2006 by Diana Aisenberg, Melina Berkenwald, Graciela (Gachi) Hasper, Roberto Jacoby, the Residencia Internacional de Artistas en Argentina is locally referred to simply as RIAA (in Spanish, pronounced: ree-ah). The residency brings together about ten artists from Argentina and ten others from abroad for a period of two weeks. The selection process is based on nominations. Artists all meet in Buenos Aires for a two-day period or so, where they each give a 30-minute artist’s talk to present their work. Afterwards, the artists head to Ostende, a beech town about 2 hours away from Buenos Aires. The group takes over the Viejo Hotel Ostende (in operations since 1913) settling there for the rest of the residency period. Curators and critics are invited to visit, and the site is open to the general public for an afternoon on the last weekend. RIAA takes place only once a year. I attended the last RIAA artists’ talks in Buenos Aires, which was a marathon-like public program held at the Centro Cultural de España in Buenos Aires. The quality of the work as well as the presentations varied significantly. Yet, having managed a residency program for more than four years, I can confidently attest that the “spirit,” necessary for a productive and creative residency, was certainly there. I’ve also heard from artists that have participated that they praise the program for that very reason, too. Most times, it is in that free and open and far away space that new ideas and communities surface. The RIAA website is complete with information of artist’s who have been in their in the last three versions (2006-2008), and with memories and statements in different prose by most of the participants. In the city of Rosario, located about 200km northwest from Buenos Aires, is the art and cultural space called El Levante. Its name is drawn from a nineteenth century brothel that originally housed the building this arts organization now occupies. El Levante’s space is great—no, it’s majestic. A bar greets you (functions seldom, primarily during events); a mirrored wall room on the right with serves as a milonga dance room; a wide open plaza at the heart of the building covered with a glass-like rooftop drenches with light what becomes a multi-purpose room, flanked by a lounge area with seats, tables and chairs. This central area is what is constantly transformed for closed workshops and public presentations. Upstairs, three bedrooms and a common room with kitchen and bath hosts the artist residency program. The many spaces are telling for the diversity of things that happen there. El Levante was initiated, first, as a “taller de análisis y confrontación de obra” (workshop for the analysis and questioning of artwork and artistic practice) by the artist Mauro Machado and the artist Graciela Carnevale. (Graciela’s work was featured in Documenta 12 in 2007, and is commonly associated with her involvement and archive of the artist’s collective and activities denominated Tucuman Arde.) A couple of other artists have become involved since: Lorena Cardona, Luján Castellani and María Spinelli (in 2005). The space soon evolved into something different, including 2-year program of art workshops were artists could register, a kind of post-BA art program, and a 2- to 3-month residency program hosting artists from abroad who would participate, if only temporarily, in the workshops. El Levante also hosts a number of other programs, evening events and milongas, which are organized with the building owners, who share the building with them. The Residencia de Un Solo Artista (RUSA) that Rosario-born artist Claudia del Rio initiated in her hometown (and at her home!) is not exactly institutional, but telling of the type of artistic endeavors spurring here and elsewhere. RUSA was begun this year, and is a genuine effort to offer a space and time for thought to someone else. This is a personal and self-funded endeavor, by an artist who makes a living at teaching art (in Argentina and most of Latin America, not exactly a lucrative career): she covers roundtrip bus fare to Rosario, room and board in hopes that the resident artist can use this brief period to think and work. An excerpt of Eloísa Oliva’s statement, published online, followed by my translation of this from Spanish to English.